Jony Ive, Apple’s Chief Design Officer, sat for an interview with David Phelan of The Independent to talk about designing Apple products in general and the new iPad Pros, Apple Pencil, and MacBook Air in particular. Because when a product has been highly regarded there is often a desire from people to see it redesigned. I think one of the most important things is that you change something not to make it different but to make it better. So, in the new iPad Pro, one of the things we’ve been wanting to get to for a long time is a sense that the product is not oriented in a primary and then, therefore, in a secondary way. The first iPad had a very clear orientation which was portrait. It had the ability to be used in landscape, I think very well, but it was pretty clear how the product was designed. And I think with the first iPad you had the sense that it was a product made up of distinct and somewhat separate components. What I think marks the new iPad Pro as particularly special is it doesn’t have an orientation. It has speakers all the way around the perimeter. By getting rid of the Home Button and developing Face ID, the tablet is able to work in all of these different orientations. I think the way it just snaps onto the side, well, that’s a nice example of a sort of that magical feeling. It’s unexpected, we don’t quite understand how it’s working and even more incomprehensible is the fact that it’s also charging. You can see how that’s aligned with this idea that you can just pick the product up and use it without thought. Actually, you’re using it with tremendous thought, but it’s based on what you want to be doing rather than wondering if you’re holding the tablet the right way up. Phelan’s interview is full of many other wonderful insights and tidbits about the products Apple revealed earlier this week in New York and should be read in its entirety. 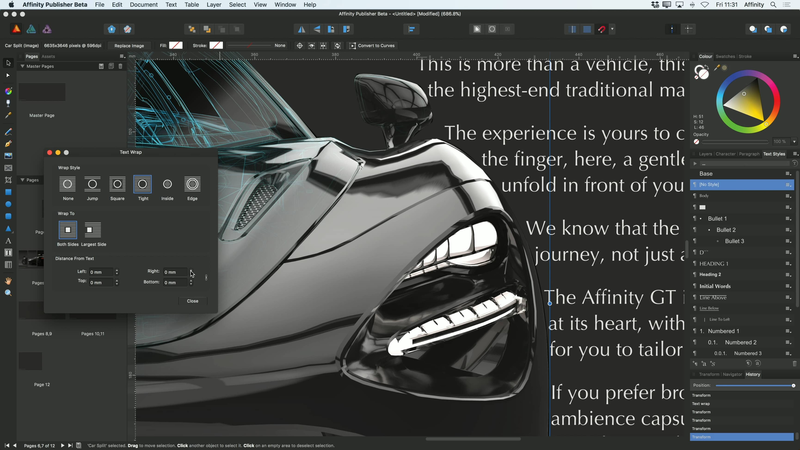 To help developers take advantage of the latest features of the iPad Pro and Apple Pencil, Apple has posted two new videos to its developer portal. Even if you aren’t a developer though, the videos include interesting insights on some of the unique features of the new iPad Pros. The videos cover development and design issues that should be considered when adapting apps to the new iPad Pros like using safe area insets to avoid crowding content into the rounded corners or under the home indicator. Another consideration to take into account is that unlike the previous iPads, the 11” iPad Pro doesn’t have a 4:3 aspect ratio, which means apps hard-coded to those dimensions will have areas cut off at the top and bottom. Also, apps that don’t link against the iOS 12.1 SDK will run in a compatibility mode when multi-tasking, which will add an inset at the top and bottom of the screen for both apps instead of running them fullscreen. Apple says that making sure iPad apps can handle the inset compatibility mode will also help with bringing iOS apps to the Mac in 2019. The Apple Pencil has a set of default double-tap settings that we covered in our iPad overview, but developers have the option to customize the double tap action in their apps. Apple also encourages developers not to hide functionality behind the gesture or turn custom actions on by default. The videos cover the iPad Pro’s new USB-C connector too. The iPad Pro supports HDR 4K up to 60Hz and external displays up to 5K as well as USB audio devices, Ethernet, and MIDI. The iPad Pro can also send simultaneous USB-C outputs, which permits uses like connecting a DSLR Camera and 5K display to the iPad Pro at the same time. The new videos are available as part of Apple’s Tech Talk series. Of course, Serif cautions that it is not ready to use in production work, but you can download the app from Affinity’s website and take it for a spin to get a sense for what is coming and provide input to Serif. The final product is expected to ship in ‘a few months’ according to the Publisher preview webpage. In addition to the signup page, Serif has published a series of 16 short video tutorials explaining the basic functionality of the app. There is also a sample brochure you can download to use as a playground for experimenting with the app’s features. 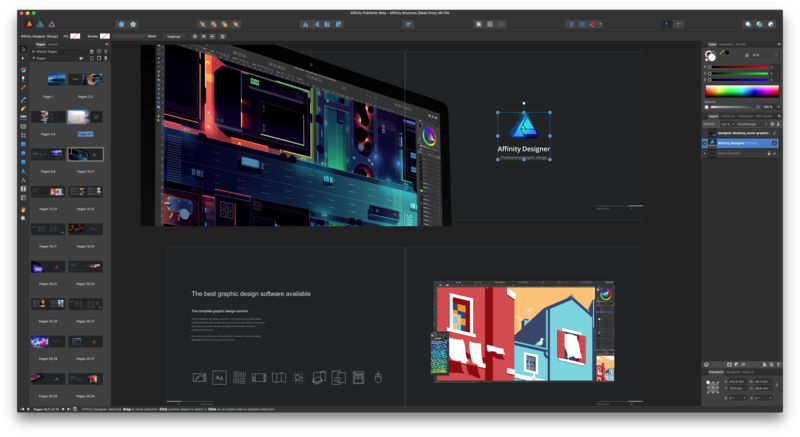 From my initial look at the beta and tutorials, Publisher is an ambitious effort to build an integrated suite of creative apps by leveraging Affinity Photo and Designer, which will be accessible directly from within Publisher. Those integrations are not yet available in the beta but will be activated in a later build. It’s been interesting to watch Serif invade an app category, in which Adobe has been the dominant player for so long, with sophisticated but cost-effective alternatives that suit the needs of many users. Publisher looks like an app that could round out the Affinity suite of apps nicely, making the trio of apps appealing to an even greater audience. As tweeted by Mike Stern, Apple’s Platform Experience and Design Evangelism Manager, Apple has updated its AppKit design resources with a comprehensive set of UI elements for making Mac apps. The UI elements come in both Aqua and the Dark Aqua variants for designing Dark Mode Mac apps. The design assets are available to download in both Photoshop and Sketch formats from the Resources section of Apple’s Human Interface Guidelines website. A full list of all the changes is available here. My gripe is there is no consistency, no structure or logic to this. Apps introduced later sometimes use rounded icons, sometimes not, sometimes create all-new custom glyphs of their own. Incredulously, you could open flagship apps like Messages, Mail and Safari and have no idea Apple was even playing with bold icons as a conceptual change. These apps adopted the iOS 11 large bold navigation bar title formats, but their icons and glyphs have stagnated for more than four years at this point. Mayo uses eight examples of Apple’s action icon to emphasize the design inconsistencies. Since iOS 7, each revision of iOS has felt like a tentative design experiment, with icons in a handful of apps moving in different directions. The trouble is, Apple doesn’t seem to have settled on a clear winner among the several options tested, which has begun to make the UI feel directionless. Although rumors seem to indicate that a design refresh of iOS is at least another year off, I hope we’ll start to see indications of where iOS design is going this year at WWDC. Sketch, the popular design app from Bohemian Coding, received a big update today, but perhaps the most interesting aspect of the update is the incorporation of Apple’s official iOS 11 design template. An earlier update of Sketch added Libraries, sets of design assets that can be saved, reused, and shared. With the new version of Sketch released today, those Libraries can be stored in Sketch Cloud and shared with other Sketch users who can download and subscribe to them. The utility of the new feature is highlighted by the inclusion of Apple’s official iOS 11 UI Assets as a Shared Library. We’re really excited to say that we’ve integrated Apple’s iOS 11 design template into Sketch, and can now offer this invaluable resource as a built-in Library. The Apple iOS UI library has all of the components you’ll need to start working on your next project, carefully crafted for Sketch. This expansive Library includes everything, from tab bars and status bars to buttons and switches, ready to be inserted into your latest designs. Users can download the iOS 11 design template from the Libraries tab of Sketch’s Preferences. Once downloaded, users will receive notifications of updates to the templates. 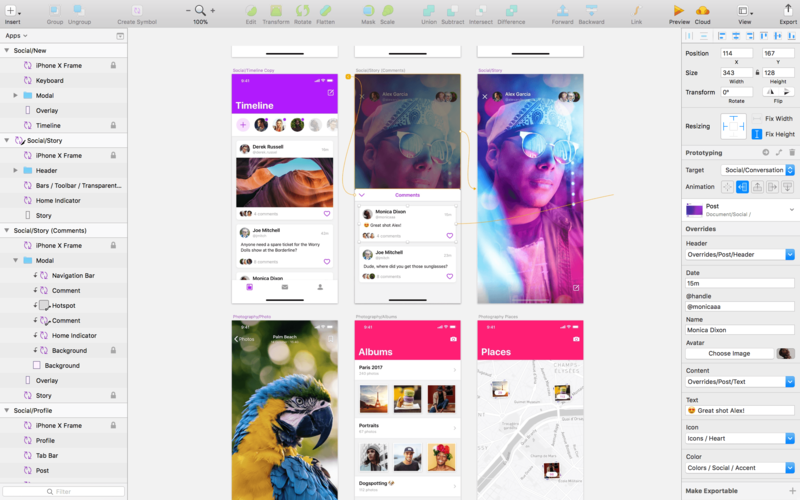 Sketch’s latest release also adds prototyping. The feature allows users to link artboards and add animated transitions. Prototypes can be previewed in Sketch, using Bohemian Coding’s Mirror iOS app, or using Sketch Cloud. To get a sense of what can be done with Sketch’s new prototyping feature, check out the video below by Sam Beckett, who has worked with MacStories in the past on Federico’s iOS concept videos. Apple Inc.’s Jony Ive, a key executive credited with the look of many of the company’s most popular products, has re-taken direct management of product design teams. 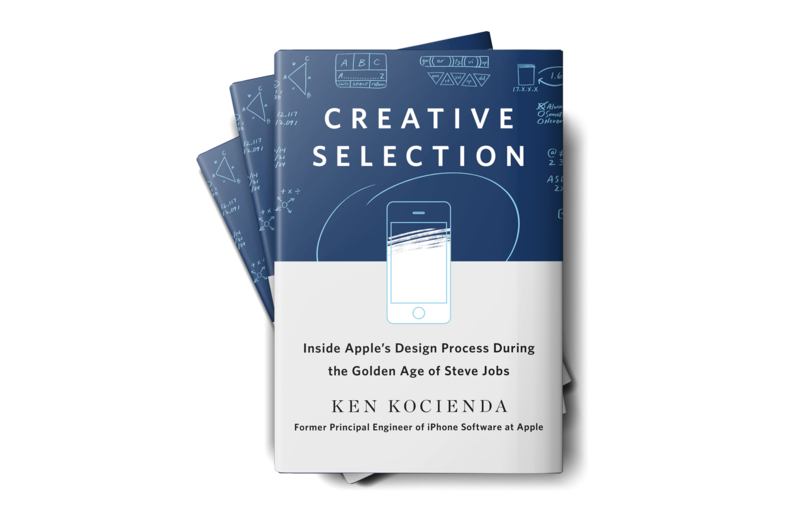 Ive, 50, was named Apple’s chief design officer in 2015 and subsequently handed off some day-to-day management responsibility while the iPhone maker was building its new Apple Park headquarters in Cupertino, California. “With the completion of Apple Park, Apple’s design leaders and teams are again reporting directly to Jony Ive, who remains focused purely on design,” Amy Bessette, a company spokeswoman, said Friday in a statement. I don't know what to think about this. I never assumed Ive would leave Apple after Apple Park was completed. From the outside, we can only infer that his return to managing the design team is important enough for Apple to issue an official statement and remove Design VPs Dye and Howarth from the Leadership page. It’s hard to parse what this means because nobody on the outside really has a good idea of what the title change two years ago meant. Jony Ive’s elevation to Chief Design Officer felt like the first steps to his retirement with Howarth and Dye taking up the posts of lead hardware and software design. Yet, Apple never tipped its hand that Ive was on the way out. I expected Howarth and Dye to slowly start appearing in keynote presentation videos, in interviews, and new product marketing. Ive would slowly fade from relevance in Apple’s public relations before he left for real. That simply didn’t happen. If anything, Ive became even more intertwined into Apple’s public image. He has done countless interviews and photo shoots in the intervening years.